Being a good blogger I took pictures all weekend, however my brain was a bit muddled from all the relaxing and so I never realised that I hadn't put in my memory card until the journey home (thanks sodarling.com for the first pic). That being said, I did manage to take some pictures of the beautiful Malvern hills before we left. The spa itself was a real treat, plonked in the middle of an incongruously bustling part of town, right off a roundabout. We signed up for a Midweek Escape package which lined us up for a massage an hour after we arrived. After mine, I felt lighter, taller, and a lot sleepier, with strict instructions from the massage therapist on how to prevent any more knots in my back (I had a collection that could put boy scouts to shame). Sam has had a funny back for years so he was feeling pretty dreamy too, and we also opted for a Moroccan Oil treatment which promised to add some life to tired scalps and some shine to limp hair (and ten minutes to the massage time, ahhh). After this we had a good explore of the hydrotherapy area where there was a life changing heated indoor/outdoor pool. The weather wasn't too bad, but it was cold enough that the outdoor area was letting off steam like an Alpine spring. Never mind the massages and aromatherapy, I think it's fair to say our highlights were the jets and whirlpools. We did also have a wander in the spa's sauna area but I think we were just too keen to get back in the pool to linger. After a few hours splashing around, it was off to an amazing à la carte dinner. I thought I had managed to photograph the masterful blackberry soufflé I had for dessert, but sadly it is now lost to history. I will say this: it came with apple crumble ice cream. 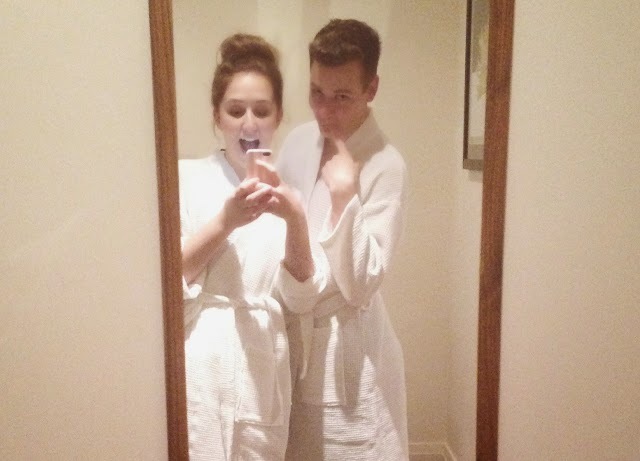 The next day, I had an invigorating Elemis facial (it's all they could slot in... we booked pretty last minute) while Sam had another swim and got ready to check out by 11. We set off for the three hour journey home and I'll tell you what, that night-- after a week of no sleep-- I was out like a light. Well worth the journey. All in all, a great little trip with my favourite person in the world. Can we go again next year?